Natural gas processing is different from oil refining. First, water and condensate are removed and sent for refining. At the gas processing plant, acid gases like hydrogen sulfide (H2S) are removed and recovered. Finally, a type of distillation process is used to pull out the liquids from the natural gas, which is then piped to market. There’s a lot of chemistry and physics involved in refining crude oil to make gasoline and the other products we use every day. Mostly though, it’s about heat. 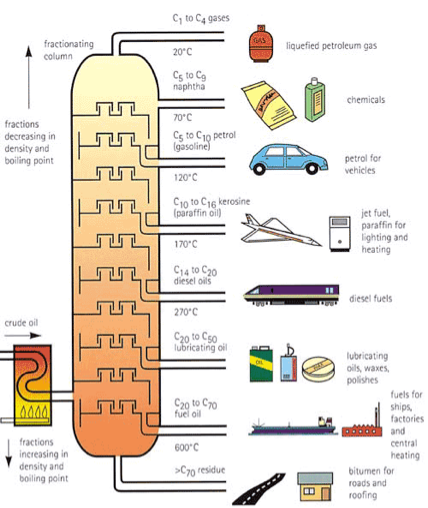 Each of the components in crude oil has a different boiling temperature, so high heat is used to separate them in a process called fractional distillation. Here’s a look at the process. The crude oil mixture is heated to about 600 °C. That’s hot! Just like when you boil water, the super-heated oil mixture turns to a vapour, which enters the fractional distillation column. As the vapour rises, it cools at different temperatures, depending on its composition. When it cools, it condenses to form a liquid, called a fraction, and is trapped in a tray. The fractions with a high boiling point condense quickly and are collected in trays at the bottom of the column. The low boiling point fractions rise to the top of the column before they condense. The first new refinery in North America in almost 30 years is being built north of Edmonton, Alberta. The illustration above shows the types of products that are made from the fractions produced at each level of the column. At the bottom, the heaviest, thickest fractions are used to make tar for roads and roofs. The fractions get lighter as we move up the column, so in the middle range we have the raw materials to make heating oil, lubricating oil, kerosene, diesel and jet fuel. Near the top we have the fractions for gasoline, as well as naptha, used to produce petrochemicals. Liquefied petroleum gases (propane and butane) come out at the very top of the column. What the illustration doesn’t show is the part of the process between fractional distillation and petroleum product manufacturing. Here’s a quick summary: After the fractions are separated in the distillation column, they are collected and then either “cracked” (broken apart), combined together, or rearranged into the chemical combinations needed to make fuels, plastics and other petroleum-based products.